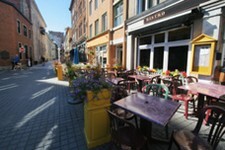 There is a significant part of Canada that is quintessentially French, yet with a difference. Unlike the popular British view of Canada, which is something akin to a rather snowy and cold version of the USA, French Canada is little slice of Europe in a country that has as much culture and character as la belle France herself. French Canada - where is it? There are various possible ways to categorise or define the parts of Canada that may be called French. Historically speaking, the name "French Canada" would refer to the St Lawrence River Valley now known as the Province of Quebec. The term is also used to describe any of the regions of Canada where significant numbers of Canadian French speakers have settled, such as Quebec, New Brunswick, Eastern Ontario, Northern Ontario and a number of small communities where francophones have gathered and made French the principal language. French Canada traces its history back to the 1600s, when the first French settlers arrived. Led by explorer Samuel de Champlain, these early arrivals established French settlements at the places that became Port Royal and Quebec City. There is, however, an even earlier claim, namely that Jacques Cartier began the march of French colonisation as far back as 1534, with the movement known as La Nouvelle France, that saw French boundaries extended into North America. Although Cartier claimed the land that he called Canada for France, these first settlements were not successful, and it wasn't until the arrival of Samuel Champlain that the French really began to establish a foothold in the country. They realised that the existence (in good numbers) of the Canadian beaver offered a possibility to produce wealth through the fur trade, and it was this trade that became the source of finance and success for the first French Canadians. Quebec grew slowly, however, with the French communities struggling against the often bitter weather and unfamiliar diseases. There were also territorial disputes, with even Quebec falling into British hands for a while. The two great French Canadian cities are Quebec and Montreal. Perhaps surprisingly, Montreal claims the second largest number of French speakers of any city in the world, losing out only to Paris (Paris Property Guide)! Although perhaps more bi-lingual, Quebec too, has a high proportion of French speakers with at least three quarters of its population having French as a first language. 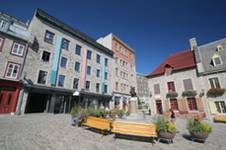 Everyone has heard of Quebec, first great city of French Canada, but what is it really like? Does it feel like North America or is it really a little piece of France? The answer is that it is strongly and proudly French, and although there are areas that characterise Quebec as unique, it is essentially French in terms of culture, language, art and ambience. When you walk down the ancient cobbled streets of the old town you forget that you are in North America at all, and could easily picture yourself to be in Carcassonne (Carcassonne Property Guide), or perhaps in the boulevards of Paris, especially when you find yourself sipping a strong black coffee and enjoying a delicious pastry in the UNESCO World heritage site that is this wonderful city. There is much to see in Quebec, from the majestic Château Frontenac, perched high above the city gazing down onto the St Lawrence River, to the 17th Century Notre Dame les Victoires Church, and the excellent ski resorts close to the city. The culture is also similar to France, with numerous colourful festivals to enjoy, such as the Quebec City winter carnival, with its grand celebration of everything that is good about winter! Montreal has the largest French speaking population of any city in the world bar Paris... which is quite an amazing fact when you consider that it is situated many thousands of miles away from France! Like Quebec, Montreal is a bi-lingual city, but "French-ness" pervades both in language and culture. The city boasts superb architectural heritage buildings such as the Marché Bonsecours, offers Parisian style Bateau Mouche cruises on the river, has superb art galleries, cultural festivals and a gourmet dining scene that only Paris itself can hope to rival. Montreal is an eclectic mix of ancient and modern, and is truly a must see destination or, alternatively, a quite incredible place to live and work. Who are French Canadians? Are they more like the French in character or more like Americans? Certainly there is a strong sense of cultural identity among French Canadians, and they take pains to preserve their traditions and language and to pass them from one generation to the next. In character and demeanour, the people of these regions tend to be very similar to the French, with a very polite and hospitable approach to others. Greetings and manners are quite formal, as in France, with "Bonjour" as a normal form of greeting even among friends and family rather than a less formal "Hi" as used in the USA and English speaking parts of Canada. The typically French "bisous" are exchanged in greetings between friends as they are in France. When it comes to religion, once more, the French Canadians resemble their European French counterparts and tend to belong to the Roman Catholic Church and to observe its rites and adopt its beliefs. Whilst the majority of French Canadians identify quite strongly with the French and view them as both role models in some respects and as the founding fathers and source of their precious heritage, there could perhaps be said to be a somewhat ambiguous relationship in existence. French Canadians have always had both a respect for and pride in the traditions of their French originators, but also a desire to forge and maintain their own unique cultural identity and language. This has, occasionally, created tensions, but in general the relationship between the two nations is an amicable one. The language in French Canada is French... but with a difference. Although the European French are usually able to understand Canadian French, there are often subtle and sometimes not so subtle variations in the language. These have occurred in these two nations who began with a common tongue but whose development, thousands of miles apart, has wrought changes in the language that can confuse and confound. If Americans and the British are, as George Bernard Shaw once claimed, "... two nations separated by a common language", then so could be France and French Canada. In fact the languages spoken in French Canada are not really just one form of French but two, namely the French spoken by the inhabitants of Quebec, Québécois, and the other variety, Acadian French. Will you be able to understand and be understood in French Canada? So, if you speak European French or English, will you manage to understand and be understood? The answer is almost certainly, as within the cities English is widely spoken and forms the main linguistic currency for commerce. Even the Québécois spoken in Quebec contains a considerable number of recognisable Anglicisms, due, probably, to the country's proximity to and interaction with the USA. You will doubtless hear the words "boyfriend", "cute", and even the Catherine Tate like "whatever", the word so beloved of stroppy teenagers in Britain! Deep into the countryside, however, it could be a different story. French speakers will probably "get by", but do expect the accent and vocabulary to bring some surprises! It depends, of course, on where exactly you are considering living. The majority of French Canadians are home owners, and the standard of living is generally high. Houses in what was Acadia, and those near to the coast, are often of timber construction, whereas those in other areas tend to be conventionally constructed from bricks and mortar or stone, according to local conditions and availability. Although prices are in general, much lower than those of comparable property in the UK, the housing market in French Canada is currently very buoyant, with prices still rising despite a downturn or slowing of growth in many other countries. The rental market is also excellent, with French Canada adopting a typically French approach to rentals, and thus being tenant friendly, with plenty of protection built in for those wishing to rent. The buying process is a little similar to the French system, in that a deposit is laid down on an offer to purchase, and this is binding as long as the conditions set at the time are honoured (Property sales in France). If the sale falls through on the fault of the seller, the deposit can be refunded. An agent will usually have access to all properties on the market, with exclusivity only entering into the process once an agent is appointed to act for a purchaser. Unlike in the UK, the practice of gazumping is almost unheard of. Education is as good as in France (French Education System - Schools in France), with the option for French Canadians to have their children educated in dedicated French speaking schools. Sport and music are of significance in French Canadian society, and the cuisine is as rich and widely acclaimed as that of European France. While retaining a distinct resemblance to French cuisine, there is an individual twist to French Canadian gastronomy that marks it out as something special.